Decent shape, got a few nicks. Gonna order new limb bolts, cut the old ones and add antler burrs. Adapt Selway softkote slide on quiver hood and gripper to Kydex and make a bolt on 2 pc. Always wanted one, would have prefered a radiused riser but the price and condition on this one I said "good enough". 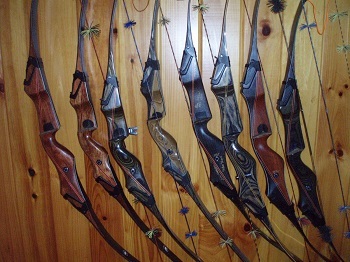 I always liked that model... the original "Tactical Bow". I was kinda wanting a skeletonized model (HF1225) but they rather club like upon closer examination. Reminded me of my first BW build, a MA2 ('87). I had a couple of SA's built much later ('01,'04) and they much nicer IMHO. So my pref is for a shorter riser/overall bow length, so that kinda killed the skeleton BW idea.............unless I found an HF 500. Thought about film dipping the riser in Turkish walnut pattern and leaving the limbs black. If it was more beat up I would. Good enough I'll probably leave it as is. She points great. Feels great too. Way lighter than my just new to me HF1225. Alas, I'm getting older by the minute and 60# is a bit of a chore. No prob last yr, but my back is acting up. Hasn't done it for years (archery related) but it's been a PITA for a week or so. Just got a 48# HF1225........and it's a bit of work. WTF???? Oh well, I'll hunt it this fall. Love 58" for a do all length, but think I'll try 56" for hunting. Test drive a PCH after deer season and figure out what to order. Hate to do it, but will sell the HS58. Gonna be a grumpy mo fo until I get a new PCH built. FWIW ....a 50# FF rated HS58 might be my ideal bow. Dunno if any were done with the bumpy "Spider web" finish, or if all FF rated ones were in the "frost" finish. On the all black BW's.............the pebble effect of the "Spider Web" I think looks better.